This book is a compelling account of the work done by astronomers and space scientists. It documents space activity devoted to exploring the planets, the moon, asteroids and comets, and the extraordinary successes we have had in learning about the solar system. The text is up-to-date with results from the Huygens mission to Titan and the discovery of new moons orbiting Pluto. There are many books written about the exploration of a single planet or the Moon. This book, however, covers all the major bodies that orbit the sun and many of the smaller bodies. An introductory chapter called “Discovering Distant Worlds” outlines the historic discovery of the planets beginning with the ancients, who could only view the heavens with their eyes. This limitation put them at a disadvantage and most of the early philosophers placed the earth at the center of the universe. The Hindus believed the earth rested on four pillars which stood on elephants that stood on a gigantic turtle. Christians before Copernicus believed the earth was at the center of the universe. It took earth-bound astronomers centuries to turn that kind of thinking around. Now, over the fifty years of the space age, astronomers have sent robot space vehicles to all the planets, the moon, and many of the smaller bodies, producing a whole new understanding of our part of the universe. The rest of this book reports on all these space missions and their findings. When I first saw the book, it gave me the impression of one of those smaller-sized coffee table editions (the book measures 8 by 8 inches). But it is not your standard coffee table book, although it certainly has nice visuals to go along with the text (there are over 250 illustrations including pictures, drawings, tables and graphs to spice up the text). In addition, it tells the living story of the human and scientific achievement of the people who have been able to closely investigate the bodies of the solar system. This book has reference value as well. Appendices list all the planetary missions grouped by target, then planetary data, satellite data, a selected reading list, and selected websites. The book was used as a reference for The Living Cosmos by Chris Impey. 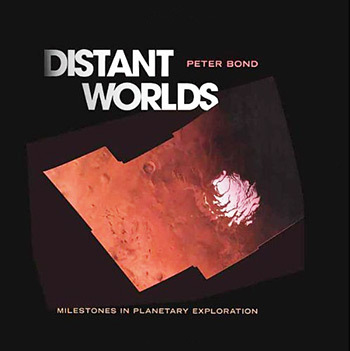 Peter Bond is an award-winning author and a lifelong space enthusiast. He is a consultant to the European Space Agency, and in 1995 was appointed as space science advisor to the Royal Astronomical Society. He has been a contributor to such magazines as Astronomy and has appeared on television commenting on the latest space developments. To anyone who wants a review of achievements in the exploration of the solar system, this book fits the bill perfectly. It is clearly written with plenty of good visual aids, and is an excellent description of the state-of-the-art in understanding the solar system. It can be read with interest by a scientist, space student, or interested layperson alike.